Download TSSI .NET SMTP Component's release package and extract all files from the downloaded package to your local disk. Add TSSI .NET SMTP Component.dll and Starksoft.Net.Proxy.dll (under "libs" folder) references to your project and import the corresponding namespaces in your code by your IDE / programming language way. Now, you are enabled to write the (E)SMTP based eMailing code in your project! To coding with TSSI .NET SMTP Component, just refer to this documentation, the Sample Codes and / or the demos (under "demos" folder). There are only two classes and one enumeration to make it easy to use: SecureProtocol enumeration, TMailMessage Class and TSMTP class. Purpose Describes the security connection protocol that used by TSMTP.Protocol property. None - normal SMTP connection, no security protocol. SSL - uses the Secure Socket Layer (SSL) security connection protocol. TLS - uses the Transport Layer Security (TLS) security connection protocol. Supported .NET Framework Versions 2.0 or higher. Purpose Represents an e-mail message that can be sent using the TSMTP class. This class is inherited from .NET System.Net.Mail.MailMessage, all native members please refer to MSDN to know more details. Here are the extended and overloaded members that made by TMailMessage. TMailMessage() Initializes a new instance of the TMailMessage class with default values. Attachments (Overloaded) Microsoft.VisualBasic.Collection (System.IO.FileInfo) The specific instanced System.IO.FileInfo collection. Gets or sets the attachments for the message. Please use this property to manage the attachments for the email. Because the native Attachments property of System.Net.Mail.MailMessage class contains the file content and much other extra information, so we overloaded it to get the lightweight Attachments property. Receipt Boolean / bool True/False, default: False. Gets or sets whether need a read receipt or not. If you set it as True, you can use the ReceiptReceiver property to designate the receipt receiver. ReceiptReceiver System.Net.Mail.MailAddress The specific instanced MailAddress class. Gets or sets the receipt receiver (name and email address) for the message. To validate this property, must set the Receipt property as True. SendTime String / string A valid date time string, format: DDD, d MMM YYYY HH:MI:SS, e.g. Mon, 4 Oct 2010 09:03:08, default: system date time. Gets or sets the eMailing date and time for the message. Use this property to make the virtual eMailing time if necessary. C#: public static bool CheckAddress(string addr) addr: a string that specifies the target email address to be checked. A Boolean value that indicated whether the email address is valid (True) or not (False). This utility method is used to check whether an e-mail address is valid or not. This is an additional method for checking the format of an email address. Purpose Allows applications to send e-mail by using the Simple Mail Transfer Protocol (SMTP) and Extended SMTP (ESMTP). TSMTP() Initializes a new instance of the TSMTP class with default values. (Enumeration) SecureProtocol.None / SecureProtocol.SSL / SecureProtocol.TLS Gets or sets the security connection protocol of the SMTP server. If you are not sure, please contact the SMTP provider. ProxyHost String / string The host name or IP address of the proxy server, default: empty string (do not use proxy server). Gets or sets the proxy server that requests are to be routed through. Supports host name and IP address, to send emails via the proxy server, must use it. ProxyPasswd String / string The password for the corresponding user of the proxy server. Gets or sets the password to be sent on all requests through a proxy server that requires authentication. Only for Socks5 proxy protocol, to send emails via the authentication required proxy server, must use it. ProxyPort Integer / int Between 1 and 65,535, default: 1080 (for Socks5 protocol). Gets or sets the remote port of the proxy server. To send emails via the proxy server and if it is not 1080, must use it. (Enumeration) ProxyType.Socks5 Gets or sets the proxy protocol of the proxy server. Currently only supports Socks5 - the common SMTP proxy protocol. ProxyType is an enumeration in Starksoft.Net.Proxy open source assembly (Starksoft.Net.Proxy.dll) that included in our product. ProxyUser String / string The username of the proxy server, default: empty string (do not need authentication). Gets or sets the username to be sent on all requests through a proxy server that requires authentication. Only for Socks5 proxy protocol, to send emails via the authentication required proxy server, must use it. SMTPPasswd String / string The password for the corresponding user on the SMTP server. Gets or sets the password for the SMTP server login name. To send emails via the authentication required SMTP server, must use it. SMTPServer String / string The host name of the SMTP server. Gets or sets the SMTP server address. We suggest you use the host name (e.g. smtp.gmail.com) for this property, do not use the IP address, because in the SMTP protocol, must use the host name after EHLO command. SMTPUser String / string The username on the SMTP server, default: empty string (do not need authentication). Gets or sets the login name for connecting the SMTP server. To send emails via the authentication required SMTP server, must use it. C#: public bool Connect(string smtpServer, int smtpPort) smtpServer - specifies the SMTP server to connect. smtpPort - specifies the port for connecting to the SMTP server, default value is 25, if the port of your SMTP server is not 25, must designate it. True - the connection is established successfully. False - Failed to connect to the SMTP server. Connects to the designate SMTP server. C#: public bool SendMsg(TMailMessage tmm) tmm - a custom TMailMessage instance that is ready for sending. True - sent the eMail successfully. False - Failed to send the eMail. Sends the designate TMailMessage instance (eMail) after connected to the (E)SMTP server. When sending email, you can observe the sending progress in the Progress event. Before use it, must use Connect() method to establish the SMTP connection first, after used, must use Disconnect() method to disconnect from the SMTP server. C#: public bool TestLogon() - True - logged on the SMTP server successfully. False - Failed to log on the SMTP server. This utility method is used to test if the given user and password can be used to log on the SMTP server or not without sending. Before use it, must use Connect() method to establish the SMTP connection first, after used, must use Disconnect() method to disconnect from the SMTP server. C#: public event TSSI.eMail.TSMTP.ErrorOccurredEventHandler ErrorOccurred desc - the human-readable error description. An error has occurred during interacting with the SMTP server. Please use this event to get the error messages conveniently during interacting with the SMTP server. C#: public event TSSI.eMail.TSMTP.ProgressEventHandler Progress id - indicates current progress ID. desc - gives the details information of the corresponding progress ID. Occurs when the eMailing progress was changed. Please use this event to get the progress when sending emails.
' * you may modify the following code that starts with the "MBC" (may be changed) mark in the comment line.
' * © TriSun Software Inc. All rights reserved.
' Imports TDNSC's namespace first.
' Some native members of this namespace will be used in your code.
' The third-party open source proxy library.
' Just for the attachments.
' TSMTP instance (used to send eMail via the (E)SMTP protocol).
' TMailMessage instance (the eMail for sending).
' Send a plain text message.
' Initialize the error messages box.
' Initialize the progress box.
'' Set the interface to be busy.
' Display the exception also.
' Always disconnect from the SMTP server.
'' Set the interface to be normal.
' Send a rich text message.
' Set as HTML (rich text) email body.
' The eMail content (plain text).
' Check the format of an eMail address.
' TMailMessage.CheckAddress() is a shared method, just call it from the class.
' Displays the About box, it contains the program and edition information.
' Test if the given user and password can be used to log on the SMTP server or not.
' password can be used to log on the SMTP server or not.
' Set the connection and authentication information of your TSMTP instance.
'' Set the proxy server information if necessary.
' The host name or IP address of the proxy server.
' Proxy protocol, currently only supports Socks5 - the common SMTP proxy protocol.
'' Set the SMTP account information.
' MBC: SMTP account for authentication required SMTP server (most SMTP servers need this).
' MBC: SMTP password for authentication required SMTP server (most SMTP servers need this).
' MBC: Security connection protocol, if you are not sure, please contact the SMTP provider.
' It can be SecureProtocol.None and SecureProtocol.TLS also.
' Display the error messages during sending.
' Display the progress during sending. .Subject = "A Test Message Sent by TDNSC"
' Not a HTML (rich text) email body (default). .Body = "Hi, this is a test message that sent by TSSI .NET SMTP Component." '' Add the attachments, if there is no attachment, please do not use this property.
' MBC: Sender's eMail address.
' MBC: This value will displayed in message header (From...) of the received email.
' MBC: Sets the ReplyTo address for the mail message.
' Whether need a read receipt or not, if do not need, please leave it blank.
'' you can specify a different address than _tmm.From to receive the receipt.
'' to receive the receipt.
' Make the virtual eMailing time if necessary. Format: DDD, d MMM YYYY HH:MI:SS.
' .SendTime = "Fri, 4 Jul 2014 14:03:08"
'' Specifies the priority level for the e-mail message.
'' Please uncomment one if necessary.
' please leave it blank. * you may modify the following code that starts with the "MBC" (may be changed) mark in the comment line. * © TriSun Software Inc. All rights reserved. // Imports TDNSC's namespace first. // Some native members of this namespace will be used in your code. // The third-party open source proxy library. // Just for the attachments. // TSMTP instance (used to send eMail via the (E)SMTP protocol). // TMailMessage instance (the eMail for sending). //// Adds the event handles of _tsmtp. ////// Set the connection and authentication information of your TSMTP instance. //// MBC: Set the proxy server information if necessary. // The host name or IP address of the proxy server. // Proxy protocol, currently only supports Socks5 - the common SMTP proxy protocol. //// Set the SMTP account information. // MBC: SMTP account for authentication required SMTP server (most SMTP servers need this). // MBC: SMTP password for authentication required SMTP server (most SMTP servers need this). // MBC: Security connection protocol, if you are not sure, please contact the SMTP provider. // It can be SecureProtocol.None and SecureProtocol.TLS also. // Not a HTML (rich text) email body (default). // The eMail content (plain text). //// Add the attachments, if there is no attachment, please do not use this property. // MBC: Sender's eMail address. // MBC: This value will displayed in message header (From...) of the received email. // MBC: Sets the ReplyTo address for the mail message. // Whether need a read receipt or not, if do not need, please leave it blank. //// you can specify a different address than _tmm.From to receive the receipt. //// to receive the receipt. // Make the virtual eMailing time if necessary. Format: DDD, d MMM YYYY HH:MI:SS. //// Specifies the priority level for the e-mail message. //// Please uncomment one if necessary. // please leave it blank. // Initialize the error messages box. // Initialize the progress box. //// Set the interface to be busy. // password can be used to log on the SMTP server or not. // Display the exception also. // Always disconnect from the SMTP server. //// Set the interface to be normal. Check the format of an eMail address. TMailMessage.CheckAddress() is a shared method, just call it from the class. // Set as HTML (rich text) email body. The release package contains two demos, VB 2008 and C# 2008, and all above sample codes are stored in them. 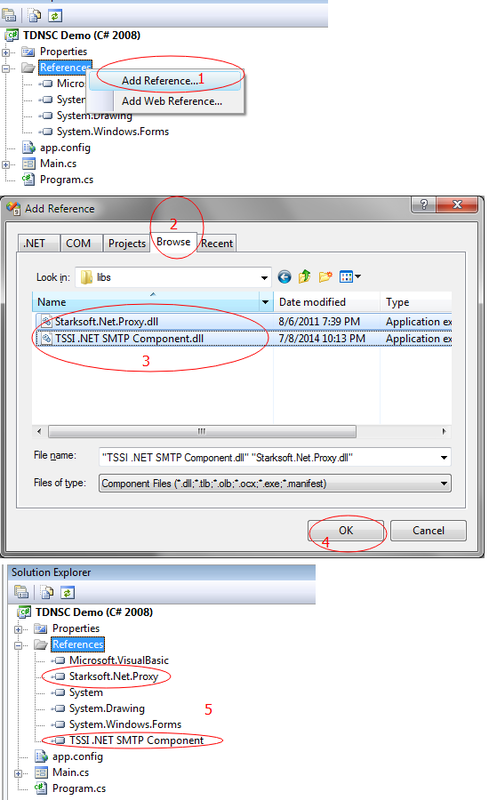 To know about how to program with TSSI .NET SMTP Component, just download the release package of TSSI .NET SMTP Component Trial Edition, and then extract all files to your local disk to learn. 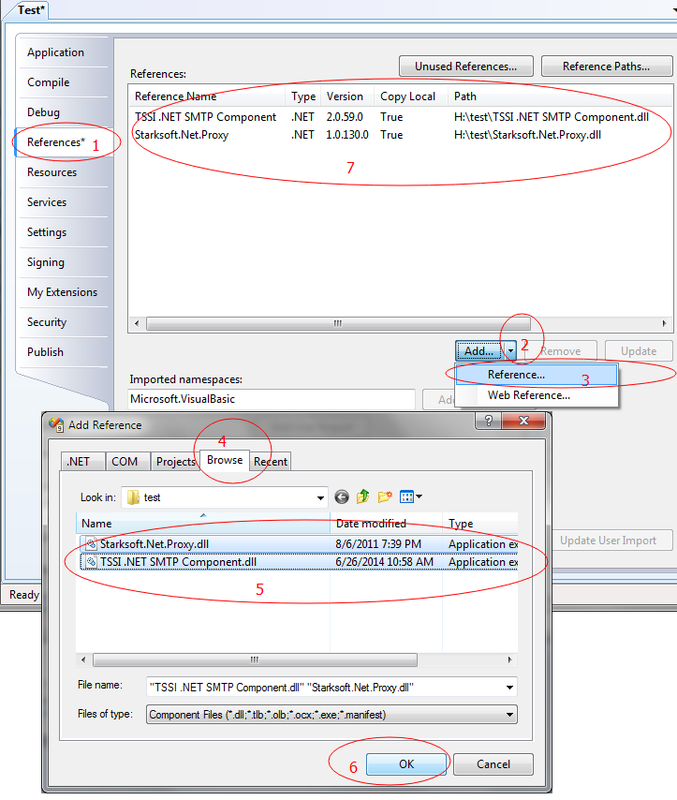 It is very easy to distribute your application with TSSI .NET SMTP Component, just include the following files in your installer / deployment package and deploy them to the same folder of your application. TSSI .NET SMTP Component.dll - TSSI .NET SMTP library for enabling your application with the (E)SMTP based emailing feature. Starksoft.Net.Proxy.dll - an open source .NET library for enabling your application with the Socks5 proxy feature. Thankfully, they are very very small: only 63 KB, if your installer has the compression feature, they only occupy extra 24 KB in your installer. tdnsc.zip - TSSI .NET SMTP Component's release package. helper.html - product information, support and other useful information on the web. license-agreement.txt - TSSI .NET SMTP Component license agreement. new-version-checker.html - used to check the new version. readme.txt - the first file you should read after downloaded. libs (folder) - the .NET assemblies of TDNSC that used to distribute your applications as above. demos (folder) - the demos that written by VB 2008 and C# 2008 for your reference as above. 1. Open "new-version-checker.html" file in the downloaded package (tdnsc.zip). 2. Download the latest version of this product from our official website if the new version is available. 3. Extract all files from tdnsc.zip to replace your old files.